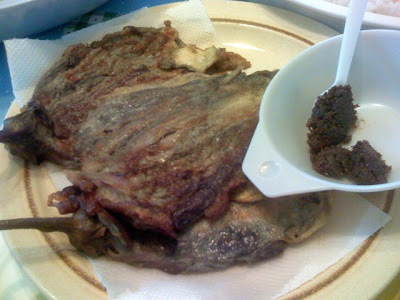 Some years ago, I had this most wonderful tortang talong in a restaurant and posted about it here (many thanks to the establishment for sharing the recipe). I had been meaning to replicate the recipe in my kitchen but never had the chance... we always end up doing this simple version which I also love. This dish is so easy to cook. All you need is some oil, salt, pepper, eggplant, and eggs! Give it a try. Grill the eggplants over medium flame. Stove flame will do nicely. Hold the eggplant by the stem to avoid getting scorched and turn the eggplant over every now and then until the skin is charred all over. Remove from flame and let cool for a while. Next, peel the skin off the eggplants. Place eggplant in beaten eggs, slightly flattening and turning over the eggplant, making sure egg thoroughly coats it. You might need to do this one eggplant at a time. Heat up oil over medium heat. Place the eggplant on the pan, flattening it a bit and pouring a bit more of the egg if you want. Just make sure you have enough for the rest of the eggplants. Cook a couple of minutes or until it's browned and proceed cooking the opposite side. Put on plate with paper towel to absorb some of the oil. Repeat cooking procedure with the rest of the eggplants. Serve with hot, steaming rice and ketchup (or bagoong!) on the side.